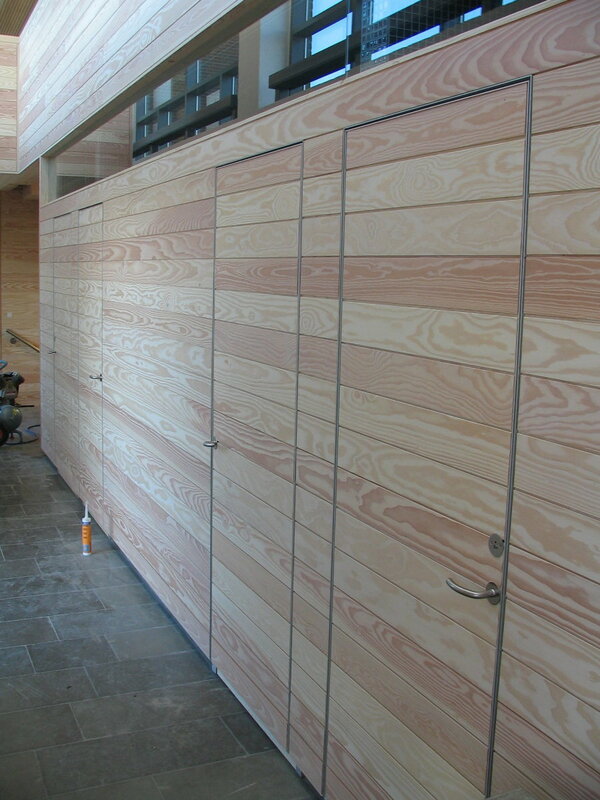 Below you see pictures from Fænø Manor where we have made walls of solid oil treated Oregon pinewood. The items for the wall lining have been processed by Dinesen Floors and appear a very exciting quality workmanship. We make wall linings of oak planks which suit your premises. No task is impossible. We will find a solution. Below you see some pictures from Danfoss A/S, where the walls are made of whitewash oak planks with hidden mounting. The items for the wall lining have partially been processed by Dinesen Floors and finished by us. These walls provide a unique result and keep the elegant overall impression of the workmanship. We only want to create solutions which give complete satisfaction to our customers. Here the great result is highlighted. See how a wall can be covered with bead boards. Please note the detail where none of the boards have the same width. This is because the lining is made in an old-fashioned way, where the product was fully used and the product determined the width of the finished item. The boards are made of whitewash ash wood. Another solution to the wall lining can be a MDF board produced as a bead board. By this solution the board is adhered directly to the wall. See here an example of how it might look.